Week after week, the postcards arrive, addressed to a name Ellie does not know, with no return address, each signed with an initial: A. With their bright skies, blue seas and alluring images of Greece, these cartes postales brighten her life. After six months, to her disappointment, they cease. But the montage she has created on the wall of her flat has cast a spell. She must see this country for herself. 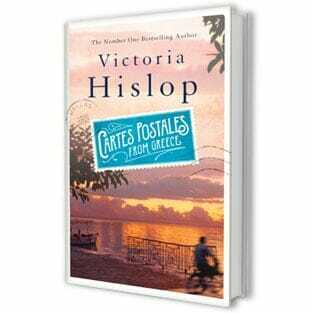 Cartes Postales from Greece is published on September 22. You can pre-order Victoria’s brilliantly original new book here.